We are pleased to announce that all three of our branches (Ringwood, Verwood and Ferndown) have achieved ‘OUTSTANDING’ for the RCVS Practice Standards Scheme Client Service Award. The RCVS is the governing body for veterinary surgeons and the Client Service Award is given to practices which demonstrate high levels of care for their clients. To the right of this article is a photo of the team members involved. 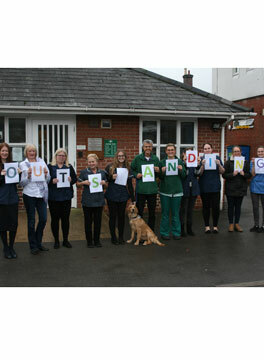 This award is in addition to the Veterinary Hospital quality assurance that the Ringwood Hospital already holds.